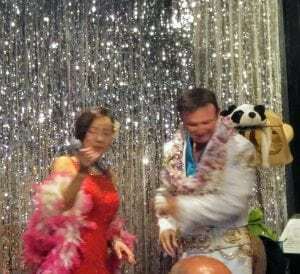 During a brief chance encounter in an office with Sherri (in a very classy black and white dress) her partner Mike asked, “Have you been to the singing Pandas?” Why no, we had not. 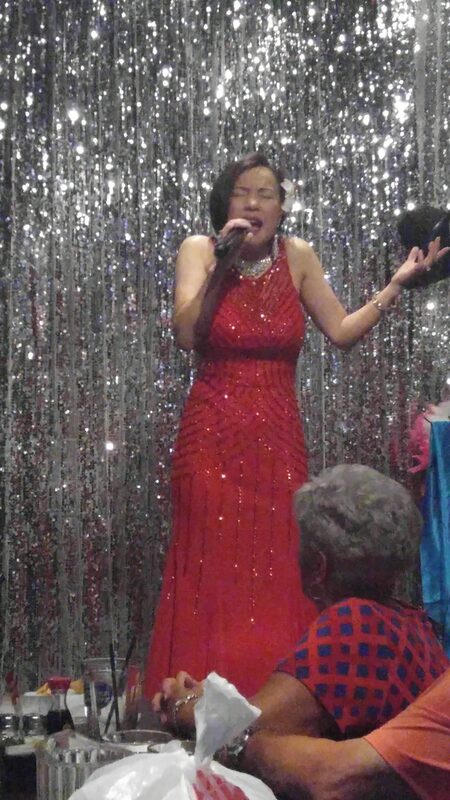 After a few words about how Sherri was a famous singer in China and how we had done business in her home town and what about this and that, we were graciously invited to a most enchanted evening at the Singing Pandas restaurant. Mike was a traveling singer. When he realized he had earned 2.2m airline miles he figured it was enough. He found the first bar in Scottsdale and told the owner George he wanted to sing there. George said, “Try Friday night.” That’s how he and Sherri met. Now Sherri takes orders in the same tee shirt as her staff but giving pats on the shoulders, and a warm owner’s welcome. 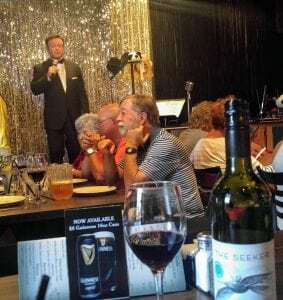 On Tuesdays, Fridays and Saturdays when the dinner plates are served, she does a costume change while Mike is warming the audience up. On our Tuesday visit he began appropriately with Traveling Man, by Ricky Nelson. Joel the bartender brings a new drink, a very big, cold Manhattan for a rendition of Dean Martin’s “Everybody Loves Somebody.” He caters to Canadians, with a joke about Dean drinking Canada Dry. The generally older crowd is back in their wheelhouse. produce are as important as the sauce recipes. Prices are very reasonable, there is no coverage charge and the show is priceless. Mike changes jackets and hats from a rack, playing Buddy Holly, The Blues Brothers and Elvis, “Don’t be cruel.” He asks, “Has anybody seen Elvis live?” There were proud hands raised. 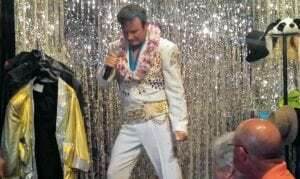 He rewards with “Blue Suede Shoes.” His jacket is in blue sequins as he shares the story of how Liberace told Elvis, “You need some bling.” The customers eat it up, and love it, like the food. Little Jake, around 5 years old was called up for a Chinese love song. Embarrassed at first and then rocking, he loved her hugs and left the stage absolutely enthralled. She told him, “I will wait for you Jake for 20 years.” This kid will NEVER forget his evening with Sherri, nor will we. Wah ah knee, Singing Pandas!